The weather in Hammock Dunes is dominated by the Atlantic Ocean. No part of Hammock Dunes is more than one mile from the ocean and half of the 1,220 properties are immediately next to the ocean. Owners in Hammock Dunes rave that they have found the best year-round climate in the US. The community is far enough south on Florida's Atlantic Coast to be dominated by the ocean for winter (versus continental weather in Jacksonville), and far enough north and west of the gulfstream to have summers warm but not sweltering. Spring and fall are the most delightful of all. Vegetation is sub-tropical and varied. The Atlantic Ocean temperature begins to rise in April from the mid-60s to around 80 by June, but the water temperature lags behind the air temperature increase prolonging “springtime” at Hammock Dunes. During Spring, northern air masses seldom penetrate sufficiently south to have any effect and prevailing winds are from the southwest and northwest. Days below 50, or much over 80, occur one at a time and rain accumulation increases. Most “snowbird” residents of Hammock Dunes stay until late May as the weather is so enjoyable versus their northern second residences, which are just starting to be comfortable. From April to June, local agricultural products are similar to what northerners would experience in August and September. The Atlantic Ocean temperatures rise from the high 70s at the end of May to the low 80s by end of June, where they remain until the end of September. The ocean water is cooler than the daytime air and warmer than the nighttime air, which leads to wonderful ocean breezes each afternoon as the dense air over the ocean extends inland to lower pressure areas keeping the afternoon temperatures in Hammock Dunes in the high 80s. This cool air then meets the eight degree warmer afternoon air in the middle of Florida triggering exciting thunderstorms for an hour or two. The weather reported in the major cities of Orlando or Jacksonville is not indicative of summer weather in Hammock Dunes on the Atlantic Coast. Florida agriculture goes into a low production phase of replanting and most produce purchased in Florida comes first from Georgia, then the Carolinas, and in September any of the vegetable areas to the north. About 50% of the property owners stay in Hammock Dunes for some portion of the summer. The Atlantic Ocean temperatures stay warm off the coast of Hammock Dunes, in the mid-70s through October and still around 70 for November, but this is nothing like the high 80 degree temperature in the Gulf of Mexico, which creates powerful hurricanes. Of course August and September are hurricane season for all of Florida, but the Gulfstream is 80 miles offshore, with 5-10 degree warmer water than the water just off the coast of Hammock Dunes, weakening hurricanes as they cross this area. Most property owners think autumn is the most pleasant of all seasons, closely followed by those who prefer spring. The Atlantic Ocean temperature drops from the mid-60s to around 60 from December to the end of February. 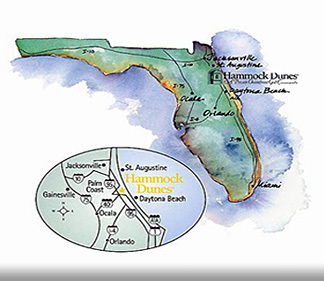 On land, for two or three days, northern cold dry air masses sometimes penetrate south to Hammock Dunes, which lower night time temperatures to 40 degrees with daytime highs pushed back into the 60s by the ocean temperature and warm sun. There are also two or three day periods when the southern air masses push north up to Jacksonville and these days have high temperatures near 80 degrees. Winds shift from all four directions every three days or so during winter. The maximum number of days below 45 degrees at night is about ten per winter season and likewise for days significantly above average. During days of stable wind conditions, the winter is the dry season and average daytime highs are 69 degrees in January, 71 degrees in February and 74 degrees in March. The Florida tomato crop is at its peak in January and February, and strawberries are abundant.